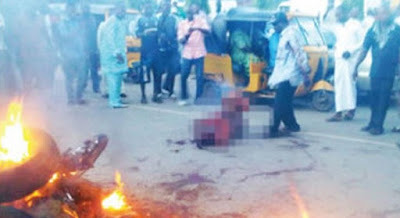 A suspected kidnapper was, yesterday, hacked to death by a mob, while another member of the group was beaten to stupor and his hand chopped off, before he was handed over to the Police. According to the eyewitness, “the mother to the children was on her way to drop her two kids at school before they (kidnappers) blocked her with their vehicle and abducted her children. “In the process, one of the kids raised the alarm, which attracted passers-by and people in the area, who, alongside Federal Housing Police Division officers, went after the kidnappers. Vanguard learned that the victims they tried to kidnap were family members of an oil worker living in Parliamentary area. Contacted, the state Police Public Relations Officer, ASP Irene Ugbo, confirmed the incident, adding that they have arrested one of the suspects, while others were still at large.